Middle East Gay Journal: Not a Pride March! 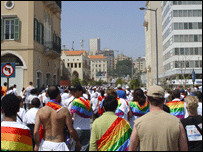 The picture is of Helem supporters at the 2005 Beirut Marathon, and not a Pride celebration. While I wish the marathon had been a Gay Pride celebration, it clearly wasn't, as Helem's participation in the Marathon Village was cancelled by the organizing committee, even after Helem had signed a contract and paid all the relevant fees. Its water stand, which won "Most Creative Refreshment Stand" was offered as a consolation. Beirut has never had a Gay Pride, although I severely wish it would. The Lebanese Political Journal and Beirut Spring just got my hopes up. I think the article is great in protraying the obstacles for gay people in the MIddle East. The fact that most terms for homosexuality are pejorative is especially poignant. Actually I have a lot to say. I'll make a post.